Alissa’s mom, Gail, has been wanting to take the girls there for a while now, and today turned out to be unexpectedly sunny, in spite of dire predictions of torrential rain. So, the girls and I were working hard at school books when she texted me, and we decided on the spur of the moment to go today. The girls did not protest at all when I asked them to close their science books and get in the car. 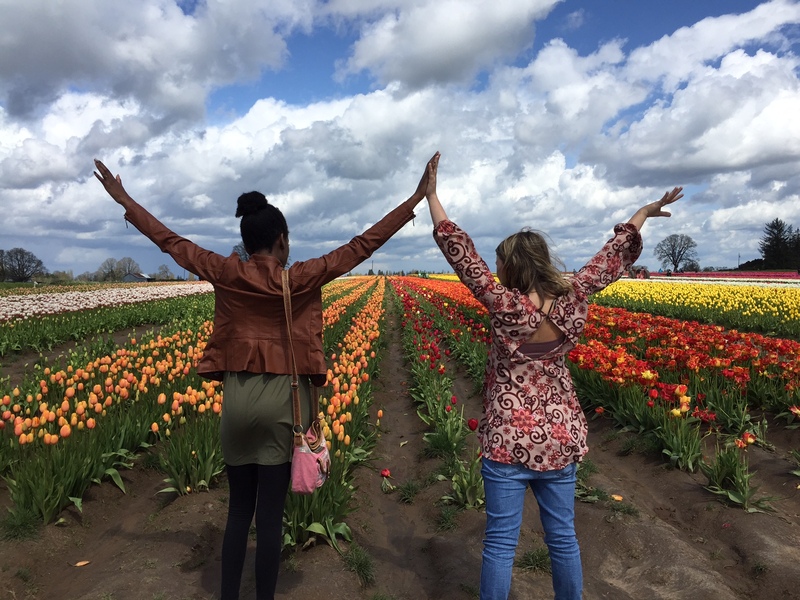 We picked our way through the mud to the field where we enjoyed a breathtakingly beautiful field of tulips. It was quite a view from the observation platform (as seen in the top picture). There was another huge field of tulips in the distance, a gift shop and restaurant, and many little booths of various items to buy. There were also things like a hay ride, a huge slide and some other fun-looking attractions. Many were closed since this was a Tuesday, but there were still quite a few people there. On the weekends, sometimes the traffic is so heavy that it impacts I-5 where cars are trying to exit to go to the fields. We were delighted to be there when it wasn’t so crowded. We had plenty of space to thoroughly enjoy the flowers. 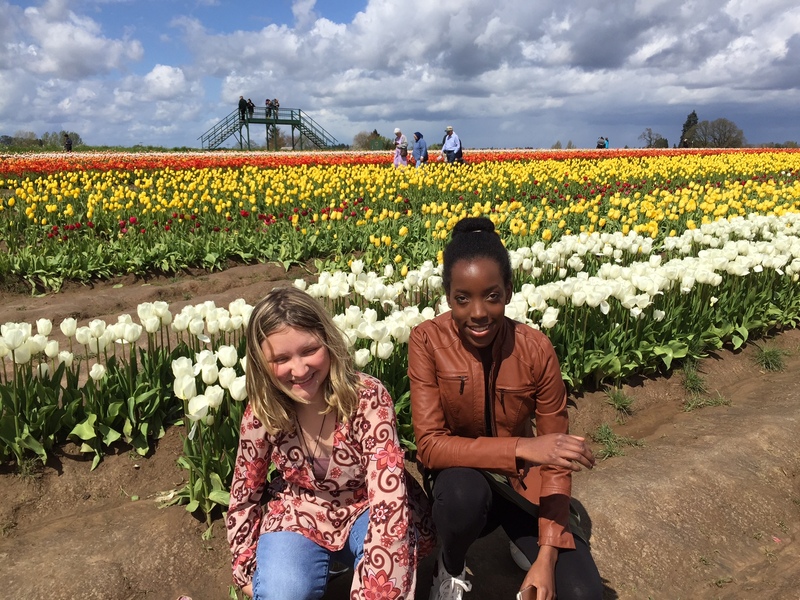 We wandered around for a while, Ja’Ana enjoyed an elephant ear while the rest of us had some food, too, admired the tulips some more, and headed back home so Alissa could do her guitar lesson and they could do math. I agree! It was great to get to go on the spur of the moment, without so many people! Oh how I wish I could have gone. It had to be so wonderful to be surrounded by so many flowers. I like visiting other gardens; especially ones I don’t have to weed. It is a breath=taking sight! Proud the girls got to take this wonderful field trip. Such a beautiful place to go! I have always wanted to go to one of the tulip festivals. The closest one to us is about a 4 hours drive. I’m not sure it would be worth a 4 hour drive unless you had other things to see in the area, loved to drive like my husband does, or just wanted a get-away. They are gorgeous, to be sure, but it didn’t take very long to see. So, there are some things we didn’t do, such as ride the hay-ride wagon pulled behind a tractor, or slide down a huge slide that would be open on weekends…….But, a great part of a weekend destination of relaxation and fun, to be sure! Great photos. What fun for the girls and a real world biology class in front of them. 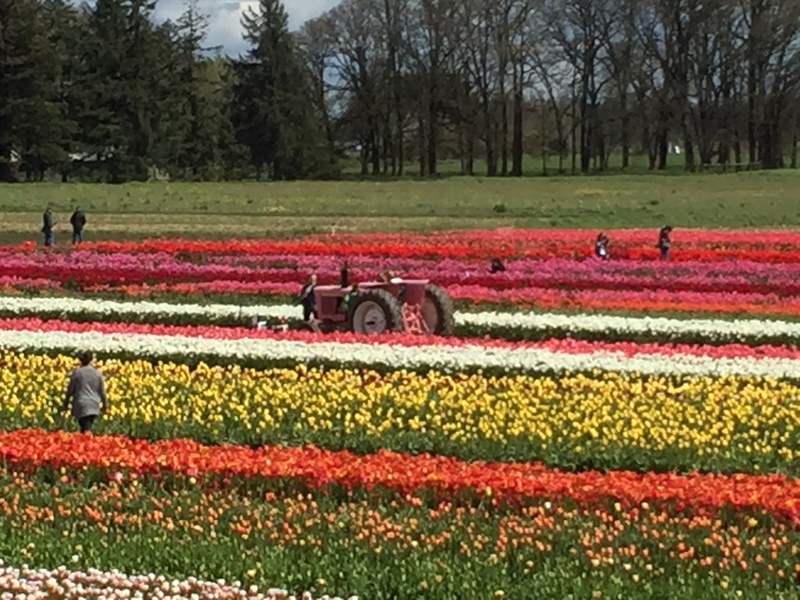 I went to the Tulip Festival north of Seattle. Once. We were in so much traffic it was horrible and the pedestrians were walking far faster then the cars were traveling. It was pretty though. I know that on the weekends the traffic is so busy that sometimes it stops the road up completely. I was so glad we were there on a weekday! How beautiful! I’d have loved a field trip like this myself. I am blessed to live in an area where they grow flowers There are also iris foelds and flower seed fields–it’s awesome! 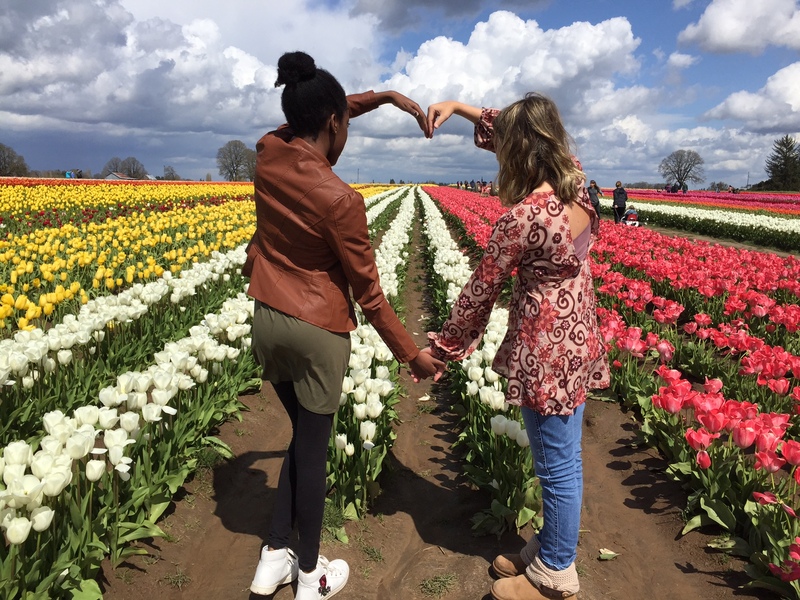 Love the photo of Ja’Ana and Alissa making a heart with their arm. Family comes in different shapes and colors, connected by blood or not necessarily. Love and caring for one another is what makes us a family. Thank you! I agree. They are both adopted, and are 6 months apart. So, long ago, they decided they were twins separated at birth:) They’ve started having me take those heart pictures at different places–it’s so cute!